The varieties of flowers selected: The more common and in season, the lower the price. The more exotic, fragile and/or limited in availability, the higher the price. The quantities of flowers needed overall: The larger your wedding party (Bridesmaids, Parents, Grandparents, Aunts, Uncles, etc...) and/or guests attending (for table centerpieces) the more flowers needed. The amount of specific flowers (by variety and quantity) the Bride requires: For example, you will often be able to garner a lower price by selecting a general category of flower - i.e. dark red roses - instead of requiring your florist to guarantee "Black Magic" roses. The effect will be very similar and imperceptible in the photographs. The amount of time and skill the various designs take to create: Simple designs require less time while more elaborate compositions or those with exquisite details will take significantly longer to craft. 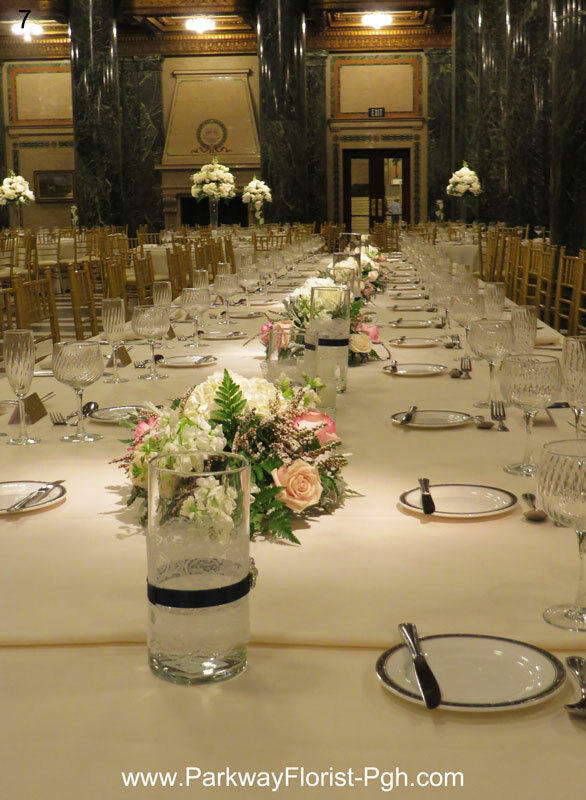 The level of service and convenience: Parkway Florist offers services such as; delivery, set-up of ceremony and reception decor, transportation of flowers from the ceremony area to the reception area, pick-up of rental equipment and wedding coordination. Each level of service is priced separately. For specific prices regarding our products and services contact us here to schedule your wedding consultation appointment. Below you'll find some price ranges for wedding flowers from Parkway Florist.